Do you know which people foods can poison your dog? Have you been inadvertently slipping toxic foods from your plate to give your dog a special treat? As a caring dog owner, it's important for you to know which foods can harm your dog. This way, you can offer healthy foods only and keep the poisonous ones safely out of reach. The kitchen can be a virtual playground for your dog's nose and taste buds. Most dogs love food and especially yearn for "people food." 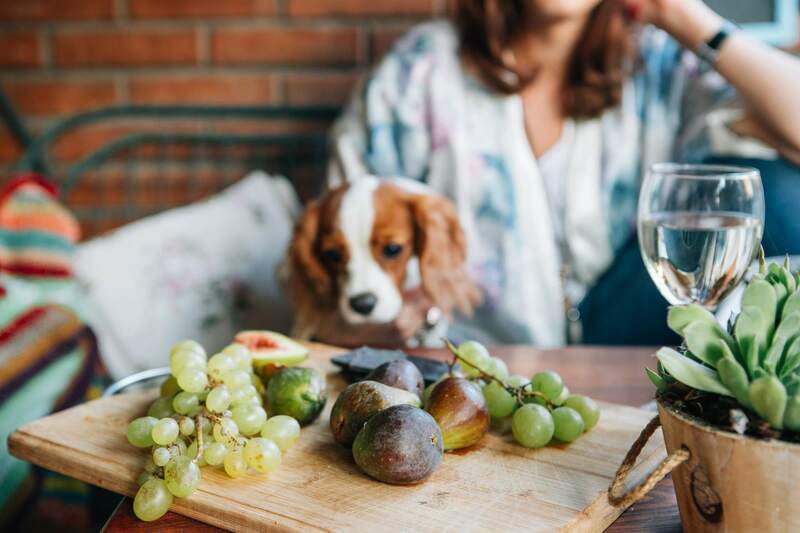 Dog experts have discouraged the feeding of table scraps to dogs for years because of the potentials for toxicity,​ illness, obesity, and general poor health. While healthy, well-balanced diets can be prepared for dogs using human food, it is essential to feed the right foods. Know what foods to avoid so you can prevent poisoning and keep your dog healthy. Be sure to seek veterinary attention immediately if you suspect your dog has ingested a toxic food. Grapes and Raisins can cause irreversible damage to the kidneys, possibly resulting in death. Ingesting as few as 4 to 5 grapes or raisins can be poisonous to a 20-pound dog, though the exact toxic dose is not established. Sensitivity depends on the particular dog. Signs of toxicity include vomiting, loss of appetite, diarrhea, abdominal pain, decreased urine production (possibly leading to a lack of urine production), weakness, and a drunken gait. The onset of signs typically occurs within 24 hours (though they can start just a few hours after consumption). Your vet may start by inducing vomiting, or the stomach might be pumped (gastric lavage). Treatment involves aggressive supportive care - particularly fluid therapy and medications. Signs occur secondary to anemia and include pale gums, rapid heart rate, weakness, and lethargy. Other signs such as vomiting, diarrhea, and bloody urine may be seen. Treatment may consist of blood transfusions and/or oxygen administration followed by specific fluid therapy. Chocolate and cocoa contain a chemical called theobromine that can adversely affect the heart, lungs, kidney and central nervous system. The caffeine in chocolate can also have toxic effects. Pure baking chocolate is most toxic, while milk chocolate requires a higher quantity to cause harm. A 20-pound dog can be poisoned after consuming about 2 ounces of baking chocolate, but it would take nearly 20 ounces of milk chocolate to cause harm. Ingestion of cacao bean mulch can also be toxic. Signs include excitement or hyperactivity, tremors, seizures, vomiting, diarrhea, abnormal heart rate/rhythm, drunken gait, hyperthermia, and coma. Non-toxic doses of chocolate may still cause some gastrointestinal upset due to the fat content and acidity. If your dog has ingested a toxic dose, your vet may induce vomiting or pump the stomach (gastric lavage). Treatment usually includes the administration of activated charcoal and aggressive supportive care with fluid therapy and medications. Signs typically begin with restlessness, hyperactivity, and vomiting. These can be followed by panting, weakness, drunken gait increased heart rate, muscle tremors, and convulsions. Macadamia nuts, while generally not considered fatal, can cause your dog to experience severe illness. The actual toxin is not known, nor is the mechanism of toxicity. Ingestion of just a handful of nuts can cause adverse effects in any dog. Signs include vomiting, weakness, depression, drunken gait, joint/muscle pain, and joint swelling. The onset of signs typically occurs within 6 to 24 hours. Dogs are typically treated symptomatically and recover within 24 to 48 hours. In-hospital supportive care may be recommended for dogs that become very sick. As few as two pieces of gum can lead to hypoglycemia in a 20-pound dog. A pack of gum can cause liver damage. Signs of toxicity can occur within 30 to 60 minutes and include weakness, drunken gait, collapse, and seizures. Your vet may induce vomiting or perform gastric lavage. The affected dog will likely need to be treated intravenously with dextrose (sugar) and monitored closely for 1 to 2 days. Many dogs improve with supportive care if treated early enough, though liver damage can be permanent. Alcoholic beverages contain ethanol, a seriously toxic chemical compound that causes central nervous system and respiratory depression. Uncooked yeast doughs also produce ethanol. Ethanol is rapidly absorbed into the system, so it is important to seek medical attention quickly. It is not usually helpful to induce vomiting. Treatment includes aggressive supportive care with fluid therapy and medications. Under controlled circumstances, alcohol is used by veterinarians as an antidote for antifreeze (ethylene glycol) poisoning. Signs of cyanide poisoning include vomiting, heavy breathing, apnea tachycardia, cardiac arrhythmias, coma, skin irritation. In some cases, antidotes are available. Other treatments include oxygen therapy, fluids, and supportive care. Note that the leaves, fruit, seeds, and bark of avocados contain Persin, which can cause vomiting and diarrhea in dogs. Also, the fat content is not healthy for dogs. Moldy or rotten foods can cause many problems for your dog, some more serious than others. Any food that seems "past its prime" should be kept out of reach. Be especially careful to keep your dog away from trash cans. Certain foods, while not considered toxic, can still be unhealthy for your dog. Avoid any foods that are high in fat, sugar, or sodium. These foods can contribute to indigestion, obesity, dehydration, electrolyte imbalance and more. Dairy products may be difficult for dogs to digest. Corn cobs can cause GI obstruction. Cooked bones may splinter and break easily, risking GI damage. Like people, too much junk food can lead to poor health and decreased energy. Remember that your dog is smaller than you and may be sensitive. What seems like "just a bite" for you is more like a small meal for your dog. If you want to feed homemade food, seek diet advice from your vet. You may wish to meet with a nutritionist for diet recommendations.